This phrase (or a variant of it), which can also be attached to a story of a king and/or a ring that has this words inscribed on it, is a sentence that is always true – in times that are good, and in times that are bad. First found in the writings of the medieval Persian Sufi poets, this simple proverb reminds us of the transient nature of everything that is, including our own existence. Nothing lasts forever. I try not to see this as either good or bad. It is what it is. The comprehension of the “law of impermanence” leaves little ground for arrogance or desperation. Knowing that nothing is eternal, life’s achievements and drama lose its seriousness and can be accepted for what they are: a mere chapter in a life of a person, a nation, a planet. Nothing matters that much in a big scheme of things. Of course, animals and humans, we have a natural survival instinct that serves the purpose of evading death for as long as possible. Pain and fear are parts of this self-preservation strategy, for they guide us away from danger. So, I am not suggesting at all, that you should ever ignore pain and fear, even though they are also impermanent. However, unlike animals, humans have an added capacity to form an identity out of their life situations, be it good or bad. Even this ability probably has some benefit for the individual, but it can also grow out of proportion, into a delusion of grandeur or, conversely, into a victim identity. When this happens, suffering is a guarantee. If you identify yourself as a victim, your whole life will be miserable; and if you have a big ego, you will suffer when things don’t go your way or when your world starts falling apart, as it will eventually. If nothing else, you will grow old and helpless. It is only when you truly accept impermanence of everything, including your own, that you can really start living your life with ease. If nothing lasts, then it doesn’t matter much if things go one way or the other. It can make a difference now, but in the long run it will make no difference. With that burden taken off of your life, you can start looking at the world as a light place. You can still strive for achievements and success, but you do it as a game, a play, and not because you want to build your self-importance, or because you want to run away from something (provided that you already have your most basic needs taken care of). 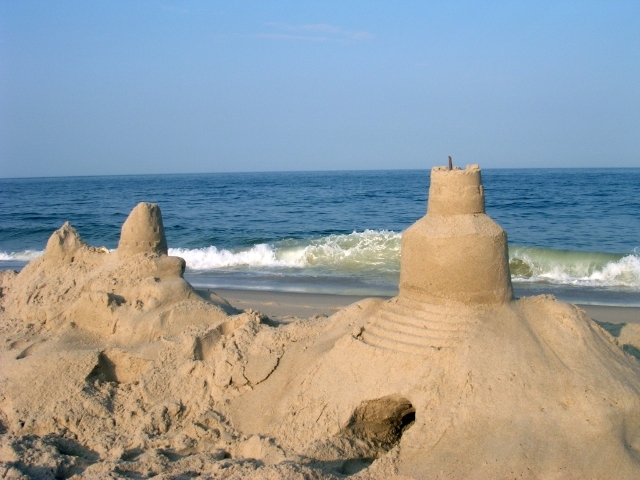 You live your life like a kid who is building a sand castle on the beach. You know that it will be washed back into the sea tomorrow – yet, you are doing it anyway, simply for the fun of it.